The Flair Puck replaces your remote control. It's also a wireless1 smart thermostat for Mini Splits, Window ACs, Portables, and more. It's easy to use, easy to control, and saves you energy. 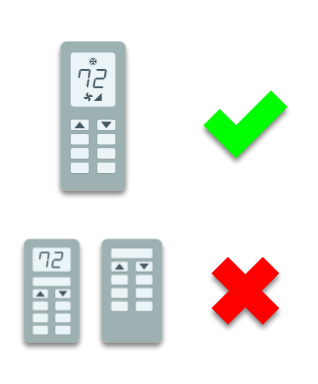 Have a Mini Split system (wall-mounted air conditioner) or a Window AC and need a new remote? Don't waste money on an old-school remote for your air conditioning or heating. Puck is the only smart, wireless1, and affordable option that works with these systems. Our sophisticated cloud-based automation can save you up to 30% on your energy bills. What remote control can do that? Want to connect your Mini Split or Window AC to a Nest or ecobee? No problem. Make your smart home brilliant. Set the temperature on our iOS, Android, or web app and never worry about adjusting your thermostat ever again. The app also keeps track of temperature, pressure, humidity, and ambient light in each room that has a Puck.